Those of you who keep track of such things will note that I've bottomed out at 3 1/2 pairs of mittens this month: Of course, that's a family portrait of Bloom, Give A Hoot, Wurst and Bavarois, all together at last. 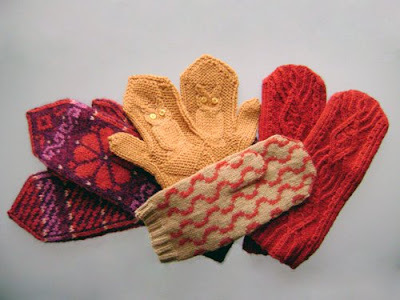 So that's it for me for NaKniMitMo 2009 -- somehow I think seven mittens is plenty. Plus, I'm almost out of January! This is not an entirely bad thing as 30 January is my birthday. Don't be fooled just because I cast on for a tam today -- there are more mittens on the way. You're shocked, I know. January 28, 2009 at 6:10 p.m. This is beautiful!!! 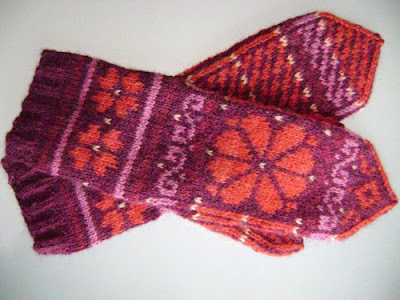 Lovely colorwork! PS: Came here through comment train. See you often in blogland! February 12, 2009 at 8:17 p.m.
your owl mittens are soooo cute!!!! March 15, 2009 at 10:44 a.m.